SilencerCo has introduced a new laser rangefinder (LRF) that mounts directly on a rifle. The new Radius rangefinder can attach to a standard Picatinny rail in any orientation. Windage and elevation controls allow the Radius be precisely aligned with your scope. This way you can place your scope’s cross hair on a target and instantly get a range at the push of a button. The Radius even includes a visible laser to help align the LRF with your riflescope. The ability to collimate (align) your rangefinder with your optic should be a boon to varmint hunters and tactical shooters. A varmint hunter in a prairie dog field can quickly range a dog mound as he scans the field for critters. A tactical competitor can get target range the instant he sees his target in his scope. With a $999 MSRP, the compact Radius rangefinder features a user-configurable display, long battery life, and extreme durability. It also has a “scan” capability that allows you to range multiple targets quickly. The Radius was developed by SilencerCo Weapons Research (SWR), a new R&D division of SilencerCo. The Radius starts shipping in October 2015. SilencerCo Radius LRF Mounted on side Picatinny rail. Image from SnipersHide Product Preview Video. At a product launch this week, SilencerCo also unveiled its new Maxim 9 silenced pistol. This integrally-suppressed, semi-automatic 9x19mm pistol is ergonomic and holsterable. 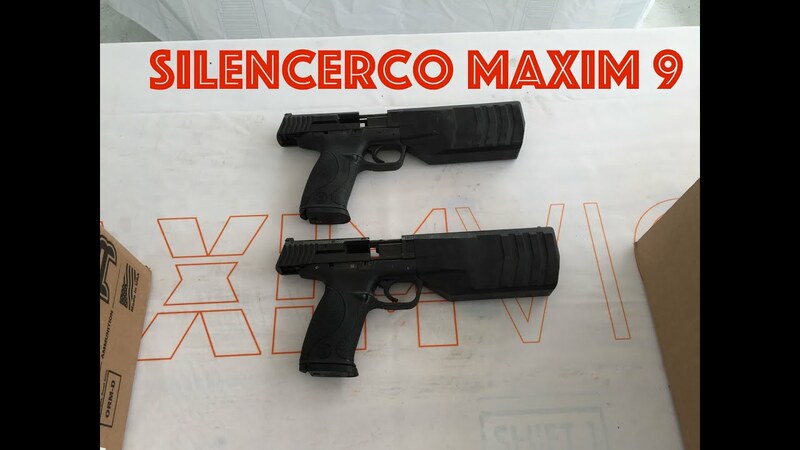 SilencerCo claims the new Maxim 9 is “hearing-safe” with factory ammo. Accordingly, the manufacturer says: “the Maxim 9 will forever change the way people think about firearms as they realize that there is no longer any reason why guns have to be loud.” Report by Chris Cheng. Share the post "SilencerCo Offers New Rail-Mounted Laser Rangefinder"
The Starlight 3-Gun Championship, a unique night-time match, takes place September 24-25 at the Peacemaker National Training Center in Glengary, West Virginia. The match is being held in conjunction with the NRA World Shooting Championship (WSC). As the sun comes down on Thursday, September 24, the world’s best 3-Gun shooters will add lights and lasers to their comp guns and compete for $100,000 in cash and prizes. The Starlight 3-Gun Championship is the result of a collaboration between industry leaders and Jim Shepherd, founder of the Outdoor Wire Digital Network. After Crimson Trace decided to “retire” its popular Midnight 3-Gun Invitational (M3GI) match in Oregon, Shepherd proposed taking the M3GI concept and growing it into a series of exciting night-time 3-gun events. Jim’s idea was to showcase the competition in a spectator-friendly format with eye-catching lighting effects. Share the post "Blazing Muzzles: Starlight 3-Gun Next Week in West Virginia"